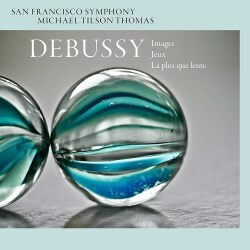 Maestro Tilson Thomas contributes the notes to this album and there recounts his continuing love for Debussy, one that dates from an early age. He comments on the sophistication and harmonic complexities of the music. “Debussy’s music captivated me. It had a sensual quality that was like no other”, he remarks. This new release from the San Francisco orchestra's own label demonstrates the conductor's devotion and resolve to probe and realise to the full the complex detail in these scores. This determination has me regarding this issue in two minds. The brightness of the recording renders these scores transparent and one can fully appreciate their detail. I am appreciative of that but on the other hand I wonder, just occasionally, about the emotional impact. In some instances Tilson Thomas scores splendidly in this respect especially in his reading of Jeux – more of this anon. Taking his Images first there is certainly no lack of atmosphere in Gigues. This is definitely a bleak, chilly Scotland. As intended the “effect is misty and far away in time and place” although the typical Scottish folk-dance is earthy enough. At the other end of the spectrum is the warmth, colour and light of Andalusian Spain in Iberia. For me it is the central ‘Perfumes of the Night’ movement that makes or breaks any performance. Here Tilson Thomas is strong on detail, atmosphere and colour but then so was Ansermet in his venerable 1961 recording for Decca. Ansermet, however, added that extra warmth, romance and mystery. I have no argument with Tilson Thomas’s Iberia outer movements. They are vivacious and joyous. The concluding Rondes de printemps depicts the French countryside in Spring using folk-like themes and drums to create a rustic atmosphere although as Tilson Thomas writes “its shape and shifting textures suggest flickers of light in Monet paintings or early films”. The conductor paints a scene of Spring awakening – a sunlit dance of burgeoning life. Jeux was Debussy’s last major orchestral work and a notable advance in his craft. That original balletic depiction of the amorous games of youngsters looking for a lost tennis ball was distinctly disliked by Debussy and so eventually the scenario altered to a dance flirtation of two young girls and one man. Again quoting the Maestro, “… the music seems to be streams of sound coalescing, dissolving, transforming. The orchestra, especially the strings is divided into many independent lines each of which requires great virtuosity and subtlety to play …” A performance demands exquisite teamwork from an orchestra and hypersensitivity between the players. The San Francisco players create a sensual, flirtatious, capricious atmosphere as the physical and mental games between the three young protagonists change and change again. One moment things are playful and at another full of commotion and emotion. Then we reach a point, signified by a high-pitched string wail, where one imagines a climax and an agonising emotion – disillusion and disappointment? - too troubled, too deep for words. Finally there is the orchestrated La plus que lente, a bitter-sweet waltz, lilting mournfully, perhaps nostalgically sharing the same emotion as Sibelius’s Valse Triste?